Law Abiding Citizen: How do you stop a blogger who is already behind Insider? Mike Moustakas hit his third home run in four games and Jeff Francoeur hit a three-run homer and the Royals beat the Chicago White Sox 10-3 Saturday night for their seventh straight victory. The winning streak is the Royals’ longest since winning seven consecutive Sept. 13-18, 2008. The White Sox have lost seven in a row, matching their longest losing streak of the year. “I think our fans can see the light at the end of the tunnel,” Royals manager Ned Yost said. Moustakas, Eric Hosmer and Salvador Perez, a trio of highly regarded rookies, combined to go 7 for 14 with two RBIs and scored five runs. AL Manager of the Year: Joe Girardi—His team has the best record, therefore he is the best manager. Why do people need to vote on this again? The Phillies clinched the NL East for the fifth straight season with a 9-2 victory over the St. Louis Cardinals. With six runs in the eighth inning, the Phillies opened up a seven run lead capped by Raul Ibanez’s grand slam. Tampa Bay scored early en route to a 4-3 win over Boston on Saturday afternoon at Fenway Park. By winning, the Rays (84-67) moved to within three games of the American League Wild Card-leading Red Sox (87-64) with one game remaining against their AL East rival and 11 games remaining in the season. Ben Zobrist got the Rays’ offense started with a two-run homer off Jon Lester in the first for a 2-0 lead. Going by a rough criteria of 4 GB or less at this stage, no AL West or NL Wildcard (both 4.5 GB) threads today. Ever wanted to wake up one morning to see Giants closer Brian Wilson tagging an “SF” logo on the side of your house? 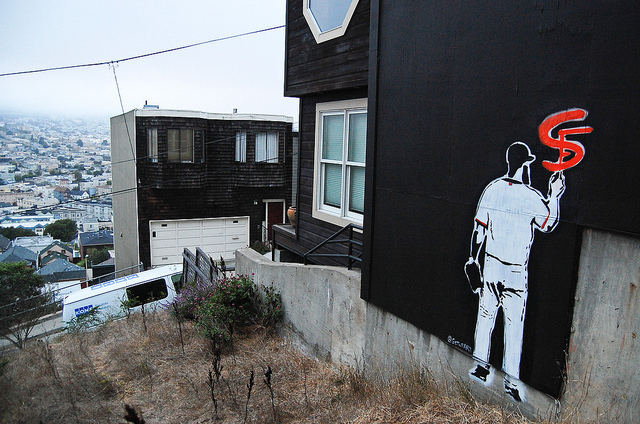 I didn’t think so, but one San Francisco homeowner tells Bernalwood’s Todd Lappin that having previously seen the above Wilson stencil appearing on the city’s streets, he couldn’t resist commissioning one for his own abode,. I suggested Get Up tag the open, south facing wall of my house (which faces a small empty lot). The next thing you know, he says as long as it’s ok with me he’d love to! Mariano Rivera closed out the Yankees’ 7-6 win against the Blue Jays at Rogers Centre on Saturday, giving him 601 career saves and tying him with Hoffman for first place on the all-time list. Rivera, who hadn’t pitched since reaching the exclusive 600-save club on Tuesday, already has a record 42 postseason saves and sports a career regular-season ERA of 2.22. Now he needs just one more save to be the all-time leader, and if he doesn’t do so on Sunday, he’ll have eight chances to get the record at Yankee Stadium. Oooooh, Poz, you’re something sort of grandish! The Yankees have seen this show plenty of times in the past six weeks, though nobody can figure out why, which could be a problem. The start of the playoffs is less than two weeks away and the Yankees are all but guaranteed a spot. But something has gone wrong with their ace, who has labored in almost all of his outings since Aug. 1. “He just hasn’t been quite as sharp,” Yankees manager Joe Girardi said. It’s time to reconsider Mottel 6 ERA! If Cardinals management approaches him later this month about Jason Motte’s readiness to close games for the club in 2012, bullpen coach Derek Lilliquist has a ready answer: Absolutely. Having witnessed Motte’s evolution from almost solely a four-seam pitcher into a talent who commands a sinker and a cut fastball, Lilliquist offered his emphatic endorsement before Friday’s series opener against the Philadelphia Phillies. “I don’t have to think about it. I’ve got my answer,” he said.